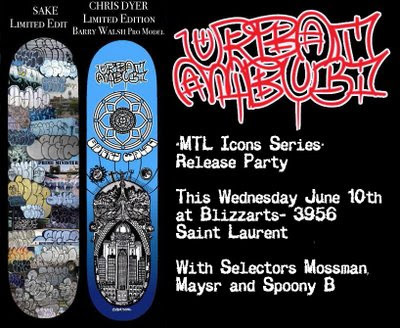 Urban Ambush is Montreal's coolest brand coming straight from the underground frontlines. I am honored to have finally done a graphic for my good friend Barry Walsh, an already legendary Pro skater who has payed more dues than most. In this 2 board series I am accompanied by SAKE, Montreal's king of Bombs. If you are a hater (cause he's probably already tagged your own property), this is a chance to scratch out his art, while having fun ripping.